In composition studies, feminism’s goal is to foster a nurturing classroom that focuses on much positive, constructive feedback on writing. An instructor with a feminist pedagogy is unlikely to favor or focus on an androcentric direction of teaching nor will they give any sort of critique on the androcentric viewpoint. A feminist approach in composition “would focus on questions of difference and dominance in written language”. 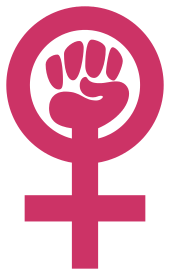 In the 1960s, the second wave of feminism began and one major goal was to raise society’s consciousness of the struggles of women. The goals of feminists were largely carried out in university classrooms. Specifically, in the composition classroom, some claimed that the way writing was taught largely favored male writers. Female writers, struggling to strive, felt as if they were not intellectuals (Howe). The task at hand then was to learn how to teach composition to women. Some claimed that women implicitly write differently than men, and that men tended to write in the dominant, most oft taught style. Mary P. Hiatt argues that the terms “masculine” and “feminine” are applied to styles of writing–that of men and women, respectively–but, instead of describing the style, what is actually described is the male views on both men and women. Her examples include “strong,” “rational,” and “logical” for men, and “emotional,” “hysterical,” and “silly” for women. Thus, the aim of feminism in composition studies was to create a classroom in which women perceived themselves intellectually and in which their voices were relevant in what some feminists perceive to be an androcentric world. Elizabeth Flynn writes that feminist theory “emphasize[s] that males and females differ in their developmental processes and in their interactions with others”. Thus, a feminist instructor will take into account the implicit differences between male and female writers and teach appropriately, without favoring or focusing on androcentric or gynocentric studies. Feminist pedagogy involves reading texts written by women, and taking care to understand those texts are not simply appropriations of texts written by men, without any sort of critique of androcentrism. Focus is also placed upon the reading and reviewing of student-created texts. Feminist instructors try to create a supportive classroom environment and validate student’s experiences. Susan Jarratt mentions a feminist pedagogy that advocates women writing about “personal experiences after reading women’s autobiography, history, and fiction”. Flynn researched the narratives of her first-year composition students for their disparities. She says, “The narratives of the female students are stories of interaction, of connection, or of frustrated connection. The narratives of the male students are stories of achievement, of separation, or of frustrated achievement”. Feminist research “tries to arrive at hypotheses that are free of gender loyalties,” says Patricia A. Sullivan. Sandra Harding lists three characteristics of feminist research in her book Feminism and Methodology that Sullivan deems appropriate for consideration into feminist studies of composition, not just the social sciences, which is what Harding is concerned with. These characteristics are, first, using women’s experiences as an “indicator of the realist against which hypotheses are tested.” Second, the research is “designed for women” and provides “social phenomena that [women] want or need.” Third, it “insists that the inquirer her/himself be placed in the same critical plane as the overt subject matter” . Sullivan believes these three characteristics are relevant to composition studies because of the common practice to conduct research from a standpoint that is gender-neutral (neither men over women, nor vice versa), gender-inclusive (considering both male and female perspectives, processes, and styles, not just those of females), and researcher disinterestedness (the common practice of keeping one’s self out of the research process in order to allow for an unbiased analysis). 1 2 3 4 Flynn, Elizabeth. “Composing as a Woman.” Feminism and Composition: A Critical Sourcebook. Kirsch, Gail E., ed. Boston: Bedford/St. Martin’s, 2003. 243–55. ↑ Moar, Faye Spencer. “Part One: Introduction.” Feminism and Composition: A Critical Sourcebook. Kirsch, Gail E., ed. Boston: Bedford/St. Martin’s, 2003. 29–31. 1 2 Hiatt, Mary P. “The Feminine Style: Theory and Fact.” Feminism and Composition: A Critical Sourcebook. Kirsch, Gail E., ed. Boston: Bedford/St. Martin’s, 2003. 43–48. ↑ Jarratt, Susan C. “Feminism and Composition: The Case for Conflict.” Feminism and Composition: A Critical Sourcebook. Kirsch, Gail E., ed. Boston: Bedford/St. Martin’s, 2003. 263–280. 1 2 Sullivan, Patricia A. “Feminism and Methodology in Composition Studies.” Feminism and Composition: A Critical Sourcebook. Kirsch, Gail E., ed. Boston: Bedford/St. Martin’s, 2003. 124–39. This article is issued from Wikipedia - version of the 3/28/2013. The text is available under the Creative Commons Attribution/Share Alike but additional terms may apply for the media files.